The excerpt below, from A Place of Her Own: The Legacy of Oregon Pioneer Martha Poindexter Maupin, presents a few opening and closing paragraphs from the short Prologue, as well as opening lines from Chapter One. A gentle breeze whispered through the new leaves of the scattered oaks crowning the ridge by my house. Echoes stirred in me. I moved into the dappled shade of a double oak overlooking the field below, where lush spring grass shimmered across the land like waves of green silk. The old tree leaned toward the long downward slope as if keeping watch over the stepped pasture to the river valley at the bottom. Its second trunk, a late offshoot, smaller, younger, stood in its shadow. I ran a hand over the rough bark and looked into the intertwined branches. A subtle sweetness of emerging growth scented the air. Again a whisper rustled the leaves, and I wondered what the oak was trying to say to me. It felt like a sentient presence. Or was it her presence I felt? Martha. My great-great-grandmother. The breeze riffled the hair on my neck and sent a chill down my back despite the warmth of the late afternoon. Did she stand here on this same spot on the hill, marveling that this land was hers? Not the land of her husband. Not the land of a landlord. Hers. As now it was mine. Her husband died less than two years before she came here. My marriage ended twenty years ago, and my father had been gone three years. I bent forward to glance at the far side of the old tree and imagined her there, sharing this wonder across time. 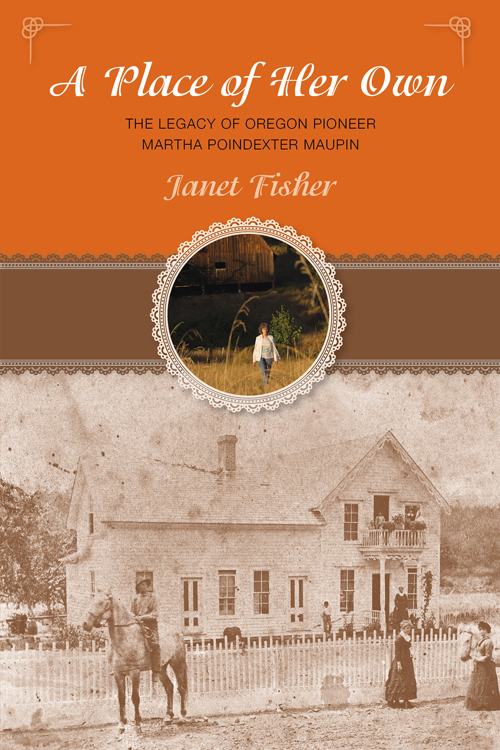 As a woman I was drawn to Martha’s story, especially now that I owned her farm, but I would need to search for answers through the remnants of recorded memories, and the echoes, left behind. I hoped to do more than write a family narrative. I wanted to know her. Murmurs stirred in the leaves overhead, and I tilted my head to listen. Sweet crisp air wafted into the little cabin through the wide-open door and windows. Birds twittered. A jay screeched. Sap was rising in every branch in the surrounding woods. Martha held the broom upright with both hands and took a twirl in the middle of the floor. Two long steps brought her to the wall, where she reached up and swept the bristles across the dingy logs, wanting to make the place gleam with welcome. Her brother Doc was coming home, and her brother Stephen and his family were visiting from Macoupin County. How she’d missed them, especially Doc. She gazed about the small log structure with its sideboard for cooking and its fireplace, all cleaned and ready for a cozy fire. She loved this cabin. Nestled in the woods behind her parents’ big log house, it had been a place of joy for her from her earliest memory. Pa built it for Grandpa and Grandma Wood, Ma’s folks, soon after the family settled this farm on the western Illinois frontier, back in 1830 when Martha was only a year old. She’d spent many happy hours here with her beloved grandparents. Grandpa always had time to laugh and play with her, and to show her the wonders surrounding them—plants and how they grew, tiny insects and frogs, the delight of a tugging magnet, the mystery of a sundial he built out in the clearing. He taught her the pleasure of reading and writing, and clever tricks with numbers. She remembered him so well, though she was only six when he died. Grandma died soon after, but Ma would not let Pa turn this cabin into a corn crib or work shack. She kept it for visitors, like Stephen and his family, and maybe for the memory of her parents. Martha and her younger brothers used to play here and make believe all sorts of exciting stories. Smiling, she lifted the broom again to whisk out a dusty corner, feeling feather light as she thought of those free and happy days. Stephen stood in the doorway. She hugged him, and Jane and little Peter. Martha picked up a loaf of Ma’s warm bread, relishing the delicious aroma, and set it on the cutting board to slice. Family members poured into the house, talking and laughing. Ambrose, Martha’s oldest brother, gave Martha a wave and smile across the room, as his wife Polly ushered in their two boys. It had been a long time since the whole family was together. Martha shook her head, breathless with all the rush. She’d be glad for Louisa’s help. “Missouri?” Pa’s voice, rising above the murmur in the room. Martha glanced his way. Doc and some of the other boys had gathered near Pa, their hands animated as they spoke. Pa leaned forward, intent on the conversation. The room vibrated with excitement. What was going on? Her tall, handsome husband stepped up behind her carrying little Perry. John Bronough looked every bit the gentleman with his tailored suit. Even a vest. He took off his tall hat, hung it on a peg on the log wall, and gave a passing smile to everyone, proceeding to greet each one. After quick hugs for the long-absent relatives, Louisa grabbed an old apron and went right to work helping Ma. She always seemed to know what to do without Ma having to tell her. Martha would never forget how her own life changed when her sister left. There were only two girls, and since Louisa was older than Martha by seven years, Louisa was usually the one Ma called on to help her. Oh, Martha had her chores, but being so much younger, she always had time to run and play with her brothers. Then Louisa married her handsome John Bronough, and Martha’s freedom ended. She heaved a sigh, remembering. Eight years old and a drudge already. Martha snapped her head around to give Doc a straight look.Leaving? Doc? Missouri? He’d just gotten home from Stephen’s place in Macoupin County. But that was right next door to Greene County, here in Illinois. Now he was going to Missouri? She bit her lower lip. Well, Missouri wasn’t so far. . . .
Martha’s mouth dropped open. Close to the edge? The western edge? She’d never see Doc again.